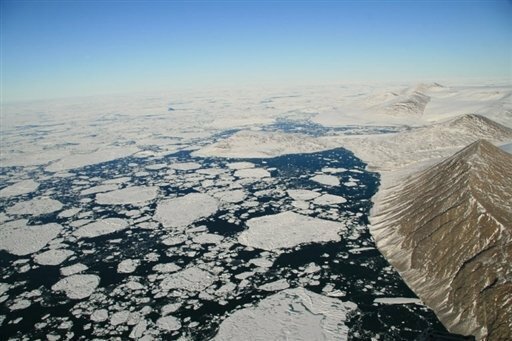 Handout image shows Markham Fjord in the Arctic Ocean off Canada’s far north in August 2008 after the Markham Ice Shelf broke away. Arctic sea ice, which has been declining in area by unprecedented amounts in summer, is also falling in volume, the European Space Agency (ESA) said on Wednesday. PARIS (AFP) – (AFP) – Arctic sea ice, which has been declining in area by unprecedented amounts in summer, is also falling in volume, the European Space Agency (ESA) said on Wednesday. “CryoSat continues to provide clear evidence of diminishing Arctic sea ice,” said Andrew Shepherd, a professor at the University of Leeds in northern England. Some ice experts say that the clue to summer ice lies in what happens during the winter. Thinner or less extensive ice in winter can lead to further losses in the following summer. CryoSat — essentially CryoSat-2, replacing an original satellite that was lost at launch — was taken aloft in April 2010. It has an all-weather microwave radar altimeter, capable of detecting changes in ice thickness to within one centimetre (0.4 of an inch). The satellite had a designed operational life for three years but is in good health and should be able to continue until 2017, ESA added.